One of the most popular outings for guests at our holiday villa in Andalucia is to the stunning blue waters and pine-forested slopes of Andalucia’s lake district at El Chorro Gorge, 25 minutes' drive away. The three sapphire lakes are surrounded by pine forests and dramatic scenery. Enjoy a swim in the lake followed by a picnic on the shore or, better still, a delicious meal at our favourite of the lakeside restaurants, El Kiosko. Villa guests who like to spend more active holidays should note that the Chorro Gorge is also a favoured destination for climbers from all over Europe. In addition the thrilling Caminito de Rey walkway through the gorge has now been restored and re-opened to the public. Known as one of the best hikes in Europe, it’s a great outing for adults and older children. Also within a 30 minute drive is the Torcal National Park, one of the most spectacular limestone landscapes in Spain. Eerie shapes carved out of the rock by the elements testify to the time when this area emerged from under the sea about 100 million years ago. There is an interesting visitor centre for those who want to find out how this dramatic landscape was created and 3 different walking routes from the very easy to the more challenging to enable visitors to discover the fauna and flora of this extraordinary landscape, while eagles soar overhead. A great outing for adventurous families! A must for guests at our holiday villa in Andalucia is the beautiful town of Antequera. This historic Roman town has excellent shops and a wonderful market where all kinds of fresh meat and fish can be bought. There are many good tapas bars and restaurants, including an outstanding one right inside the nineteenth century bullring. Relax in the shade of the huge trees in the beautiful parks and drop into the Parador for lunch in its restaurant with panoramic views of the surrounding countryside. This charming Andalucian village, just a few minutes' drive from Casa La Sierrecilla, is best known for the Laguna de Fuente de Piedra, a magnet for birdwatchers from all over Europe because of its flamingo colony and other aquatic birds. There are several trails around the lagoon and a visitor centre where binoculars can be hired. Sunset guided tours are available in July and August. Visitors to Fuente de Piedra will also want to stop off at our lovely local Donkey Sanctuary (El Refugio del Burrito) where you can meet the friendly donkeys and even adopt one! 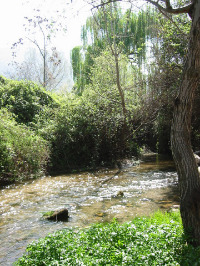 Set between the mountains of the Sierra de Loja is Riofrio, where beside the sparkling waters of the Rio Frio, freshly caught trout is served to enthusiastic diners in many restaurants. You'll be amazed at the variety of ways to cook trout! And, of course, the restaurants serve all the other Spanish favorites as well! There are many little market stalls set out along the river to tempt holiday souvenir hunters! 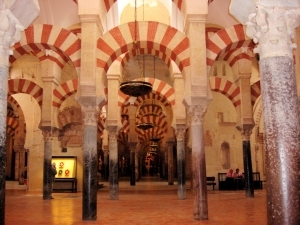 Cordoba also contains a wealth of historical treasures from both Arab and Roman occupations. By far the most outstanding is the Great Mosque or "Mezquita", begun in the eighth century and justifiably considered the eighth wonder of the world in its day. This is a monument which far exceeds the expectations of most visitors. Also unforgettable is the scent of orange blossom and roses in the beautiful gardens of the Alcazar and the flower-filled patios of the Juderia district. Finally Seville, a city which really needs more than one paragraph to decribe its particular gems! Ride in a horse-drawn carriage around the lush green gardens of Maria Luisa Park, stroll around the whitewashed maze of the Barrio de Santa Cruz and visit the Alcazar - a superb fusion of Moorish and Christian styles. In addition, many happy hours can be spent sampling delicious seafood and a huge variety of tapas. We love the city of Malaga. Many travellers shoot past the city on the way to their holiday destination and never have the chance to see all that Malaga has to offer. This is a historic Andalucian city full of vitality and energy (especially during the famous Feria in August). From Antquera's Santa Ana station (just over 5 minutes from Casa La Sierrecilla) you can be in the heart of Malaga in 25 minutes. Gourmets will enjoy eating some of the freshest and best seafood in Spain on the beach in the old fishermens' quarter of El Palo (see our article on the legendary El Tintero beach restaurant!)). The restored historic centre is a delight to stroll around as you walk from tapas bar to tapas bar savouring delicious bite-sized pieces of fried fish or grilled prawns. Dominating the city is the Gibralfaro castle, which you can walk up to through the terraced gardens of the Moorish Alcazaba. Once at the top of the hill reward yourself with a leisurely lunch on the terrace of the Parador. Stretched out below the Alcazaba is the beautiful Paseo del Parque, a shady oasis in the heat of the day. It contains many exotic species of tropical plants from around the world and several play areas for children. Lovers of gardens will also enjoy the botanical gardens at La Concepción just outside Malaga which contains, among many other plants, a huge collection of different Palms. Malaga is also a mecca for lovers of museums and galleries. The very popular Picasso museum has over 200 works by this great artist, who was born in Malaga, and art lovers will also want to take in the ultra-modern CAC (Centro de Arte Contemporaneo) and the Museo Carmen Thyssen.